Every poker player — regardless of skill level — strives to earn a World Series of Poker gold bracelet. 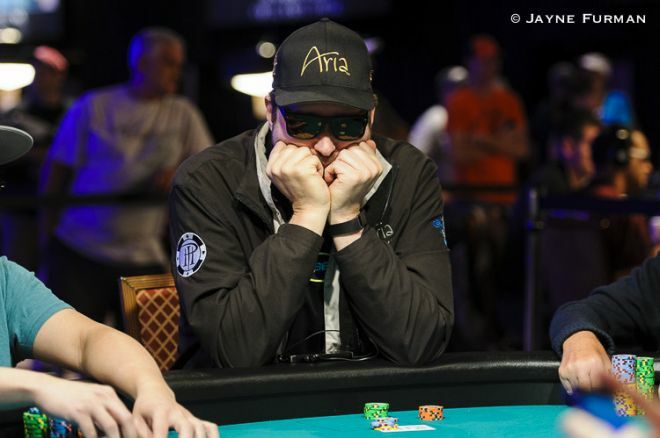 For 13-time winner Phil Hellmuth, however, there is self-inflicted pressure to capture gold in every event he enters, and he is truly disappointed and in disbelief when it doesn’t happen. Hellmuth spends tournaments talking to himself through Twitter using hashtags to build confidence and provide encouragement. In the past he has used the hashtags like #ManUp, #ChinUp, and #BraceletHunting frequently as a form of self-encouragement. This summer’s hashtag seemed to be focused on #Positivity. That’s why it was so shocking when Hellmuth’s WSOP came to an end after a huge bluff went wrong during the Main Event. As reported by PokerNews, the hand went as follows. With the blinds at 500/1,000/100, the player in the cutoff opened and Hellmuth reraised from the small blind. The player in the cutoff then reraised again — or “four-bet” — to 13,100 and Hellmuth called. Hellmuth checked the flop and his opponent continued for 8,500. At this point, Hellmuth put in a check-raise to 22,000, which was called. Both players checked the turn. When the river came to complete the board, Hellmuth bet 33,000. His opponent moved all in for Hellmuth’s last 12,000. After a short tank of about 45 seconds, Hellmuth released his hand and later revealed that he had . Hellmuth busted soon after when his failed to improve against . Hellmuth began this World Series of Poker like many in the past, assuring everyone he was a new person — that there would be no whining and more respectful behavior at the tables. While there were moments throughout the series when the “Poker Brat” reared his ugly head, the new Hellmuth emerged during the exit interview with PokerNews’ Caitlyn Howe. He was in a jovial mood considering he just busted the Main Event, admittedly a dark time for him. That alone proves anything is possible. For all the latest here at Learn.PokerNews, follow us on Twitter @LearnPokerNews! Find us as well on both Facebook and Google+!